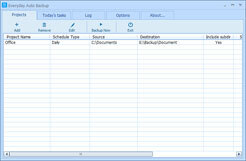 Everyday Auto Backup is an easy-to-use Freeware designed to backup files automatically. The name of the backup project. Source directory and destination directory. Backup type: Minutely, Hourly, Daily, Weekly, Monthly, Manually. Whether to include the suddirectories. The start time (for Daily, Weekly, Monthly). Whether to check the file time. If Yes the backup task will only backup newer or modified files. 1. Windows 95/98/ME/NT/2000/XP/2003/Windows Vista/Windows 7/Windows 8. 2. About 5 MB of disk space for installation. Why I can not find the setting file and the log fies?